As a businessman, Steves has ridden the wave of nearly continuous growth in international tourism during the past few decades. In 2012, the United Nations World Tourism Organization expects international tourist arrivals to surpass one billion. Europe accounted for more than half of all arrivals in 2011, and the continent is the fastest growing destination. Starting with his first and most famous book, Europe Through the Back Door, self-published in 1980, the 57-year-old writer has brought out more than 80 publications, including travel guides, phrase books and maps. He also has become a television and radio personality, producing a popular series for PBS, Rick Steves’ Europe, and a weekly public radio program, both aired in markets across the country. 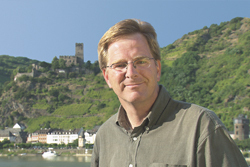 Most recently, he released a mobile app, Rick Steves’ Audio Europe, which organizes his audio podcasts and commentaries for rabid fans who call themselves Rickniks. Apart from his books, Steves gives away much of his content. In the case of his TV and radio shows, he doesn’t receive a dime in payment. It’s his version of the time-honored strategy of give it away and they’ll come back to pay. He started offering free classes in European budget travel in his 20s at the University of Washington. Soon, he was conducting minibus tours of his favorite spots. Today, Steves’ company, Europe Through the Back Door Inc., earns much of its revenue organizing these group tours. In 2011, his firm took more than 12,000 Americans on excursions to 40 countries. He runs his company from his home and “travel center” storefront in Edmonds, sending many of his 80 employees to review personally each attraction, hotel and restaurant in his guidebooks. Despite the appearance of a sprawling media empire, Steves is the antithesis of the ambitious, driven executive focused solely on the bottom line. The boyish, affable, divorced father of an adult son and daughter is clearly in control of the business, though he has divided operational responsibilities among five senior managers, in part so he can continue traveling up to 120 days a year. At the time of the interview for this story, in June, he was preparing to head out on a 50-day trip packed with 12-hour days, and looking forward to “coming home with more energy than when I left.” He measures his productivity by the number of people whose journeys he affects (up 50 percent since 2006), but he has no detailed plans for expansion. “I don’t have growth plans,” he says. “I never have. I just try to do good tours.” Steves’ company is a textbook case of staying strategically focused while allowing an enterprise to grow organically. His success in recent years has released him from “the tedius aspect of running a business,” as he puts it, and he has grown more visible in the world of philanthropy and political causes. He has given $1 million to arts groups in Edmonds, and he donates the use of an apartment complex he owns to Seattle’s Pathways for Women/YWCA, a shelter for homeless women and children. As well as being a vocal opponent of the war in Iraq, he’s a longtime advocate for legalizing, taxing and regulating marijuana, preferring much of Europe’s relaxed attitude toward the drug. He’s on the advisory board of the National Organization for the Reform of Marijuana Laws and he has joined a coalition of public officials and the American Civil Liberties Union to sponsor Initiative 502, a November ballot measure that would legalize and tax pot in Washington state. But unlike most business leaders who maintain a bright, distinctive line between their philanthropy and/or political leanings and their business dealings, hes freely allows them to mix. One of his more unusual writing projects was a 2009 book called Travel as a Political Act. For Steves, travel is a method of thoughtful engagement with fellow humans on their own turf as opposed to simple thrill seeking. “I’m inspired by lands that have morals but don’t moralize, … lands that make tolerance a guiding virtue and consider peaceful coexistence a victory,” he writes on his blog. Not all of Steves’ causes center on lightning-rod issues. In September, he pledged $100,000 to Bread for the World’s effort to fight hunger in the United States. But few projects make his singular mix of business and politics clearer than a 2009 video, Rick Steves’ Iran, an exploration of the Islamic nation styled much like his European travelogues. Though he’s troubled by the country’s “uneasy consequences of mixing mosque ... and state,” Steves’ agenda is “to get to know a people before you bomb them,” an attempt in nuanced terms to discourage aggression against Iran by the United States, even if Iranian leaders openly threaten other nations in the region. From an economic perspective, the question is whether Steves’ politics make a difference to his business, good or bad. The evidence suggests that it may actually help. A 2011 study by professors at the University of Tennessee, Knoxville, found that corporations engaging in political activities, such as lobbying and contributing to campaigns, enjoy about 20 percent higher profitability than apolitical firms. Steves may even be on the edge of an emerging trend, the “brand” that’s openly political, especially in a world where large corporations can make unlimited political contributions as if they were actual citizens, as the U.S. Supreme Court decided in the 2010 Citizens United case. In fact, most decision makers in the business world are political animals. Apart from the inevitable politics of running an organization, they show up at government meetings, campaign fundraisers, and some even put political signs on their lawns. Steves is just more unabashedly visible about his politics than most.